The simultaneous estimation of 2D pressure (P-) and S-wave velocities (VP and VS, respectively) is a promising approach for imaging subsurface mechanical properties. It can be performed with a single acquisition setup by combining P-wave refraction and surface-wave (SW) analysis. Although SW methods are commonly applied for the 1D estimation of VS, 2D profiling requires the implementation of specific processing and inversion tools not yet widely available in the community. We have developed an open-source MATLAB-based package that performs SW inversion and profiling (SWIP) so as to retrieve 1D to 2D variations of VS from any kind of linear active-source near-surface seismic data. Each step of the workflow involves up-to-date processing and inversion techniques and provides ready-to-use outputs with quality control tools. 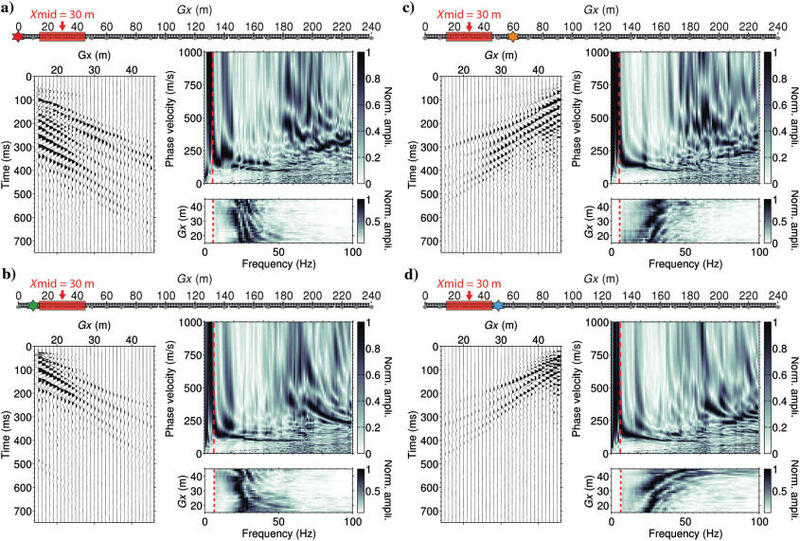 First, windowing and stacking techniques are implemented to enhance the signal-to-noise ratio and extract local dispersion images along the line. Then, dispersion curves are picked for each window with an uncertainty range in the phase velocity including higher uncertainties at low frequency. These curves are next inverted using a Monte Carlo approach with various parameterizations (e.g., user defined, refraction based). The best models are finally selected according to their fit to the data to build an average final model with a suggested investigation depth. As an example, we used SWIP to process data collected at a Yellowstone hydrothermal system. Our results show the benefits of estimating VP and VS from a single seismic setup to highlight subsurface gas pathways. © 2017 Society of Exploration Geophysicists. All rights reserved. Formerly University of Wyoming, Department of Geology and Geophysics, Laramie, Wyoming, USA; presently Virginia Polytechnic Institute and State University, Department of Geosciences, Blacksburg, Virginia, USA. E-mail: *protected email*. Sorbonne Universités, Paris, France. E-mail: *protected email*.